Chicago: Forbes & Company, 1919. 1st. Decorative Cloth. Collectible; Very Good/Very Good. The 1928 1st edition, in the uncommon pictorial dustjacket. Solid and VG in a bright, VG- dustjacket, with pronounced chipping at the spine ends, light creasing and soiling to the panels and light foxing at the endsheets. 12mo, 268 pgs. plus publisher's ads. Neat former owner name and address at the front free endpaper. New York: Wynkoop and Hallenbeck, 1873. 1st. Decorative Cloth. Collectible; Very Good. 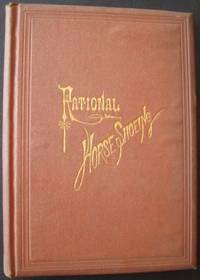 1873 1st edition of this elegant guide to horse-shoeing, with steel engravings and decorative flourishes thruout. Solid and VG in its chocolate-brown boards, with bright gilt-lettering at the front panel. 16mo, 49 pgs. Bordeaux and Paris: Feret, Fils, Editeur/E. Lacroix, Editeur, 1863. 1st. Original Wraps. Collectible; Very Good. Uncommon 1863 1st edition of this study on weather and other risks to the health of the French vineyards. Sturdy and VG- in its original wrappers, with soiling to the rear panel and staining along the spine. Thick 12mo, uncut pages, deckled edges.